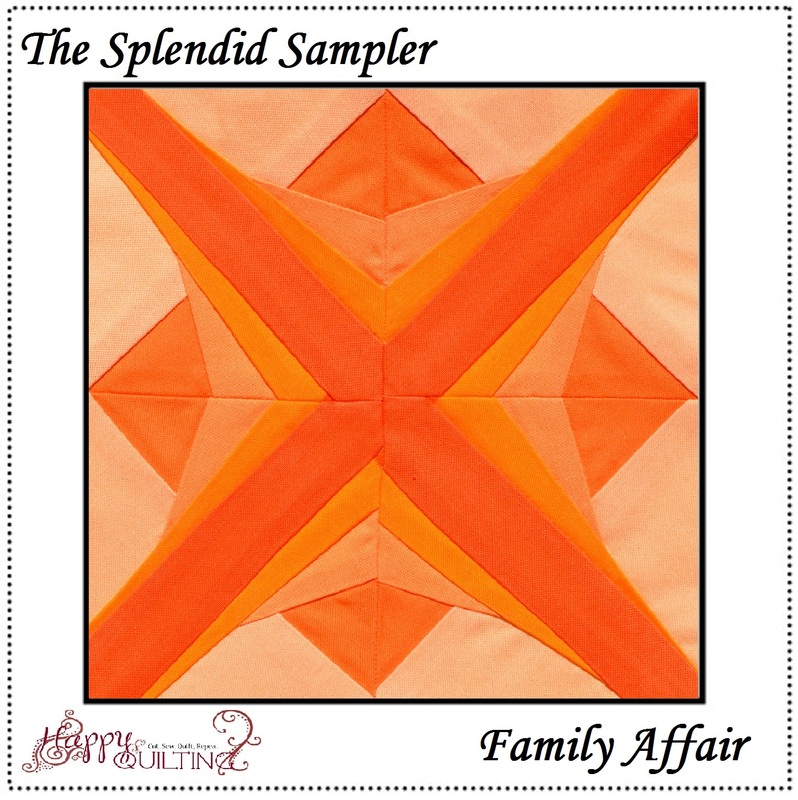 So sadly I am not going to have any Splendid Sampler Saturday Sewing time today. I am doing a little swimming in a team triathlon today and it is going to pretty much take up the day. But, since I am up way earlier than I needed to be and can't get back to sleep (blame that on the nerves) and I already have this weeks blocks done . 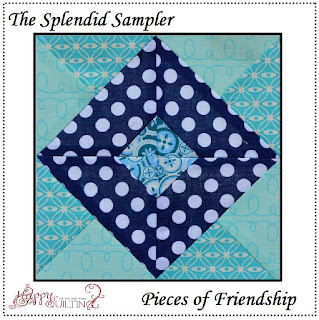 . . well why not just post my Splendid Sampler Saturday post now!! So here we go. 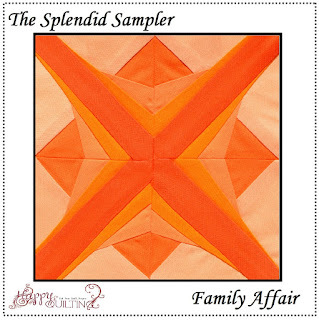 First up, the Family Affair block designed by Janice Ryan. Okay, let me just say, I don't do a whole lot of paper piecing. I want to get more proficient at it so I was glad for the opportunity to practice, and I realized once again, I really need the practice. I think I am always trying to conserve fabric and cut my scraps to small, then when I flip them over, they come up short. Ahh well, it came out in the end, and you have to look super close to be able to see the few little spots where I filled in some unaligned points with a Sharpie. (Yes, it is still a great way to "help" your points along in a pinch) Yup, practice, practice, practice on paper piecing. I just loved piecing this Pieces of Friendship block designed by Lindsay Mayland. It wen't together fast and has lots of perfect little points that just make me smile. And don't you just love the polka dots!! They add such a wonderful contrast in the block, so fun!!! So I sorted through my scrap drawer of black fabrics and then went through my white scrap drawer (which happens to be sorted into like 5 different sections) and chopped up some wonderful little 2 1/2" squares :) Now, while I am working on my Splendid Sampler blocks I will use these little guys as Leaders and Enders and crank out the chain blocks at the same time. Yippee!!! I am in a similar 'boat'. Have a sewing project to get out the door, luckily a small one. But the weather is suppose to be great today, so I want to hit the yard and my garden areas. So a bit of sewing while the sun is still coming up and then outside. Very pretty blocks Melissa, even with the Sharpie editing (LOL, I have done that a few times too.) Your chain blocks will be great leader and ender project! I love that you blacks and whites will be scrappy prints!